Today we arrived in Abu Dhabi again shrouded in a sand storm. To be fair it is not so much a storm as just a condition. There is no real wind today it's calm but the sky is heavy with a fine sand dust. The result is you cannot see more than about 400m this means you can't see the Top of any tall buildings nor can you take in a panoramic view of the city skyline. Still no matter we were off to Ferrari world today, 40 minutes by cab from the city centre lies the UAE grand prix race circuit next to the worlds largest single roof building - which is Ferrari World. This is an ultra modern theme park and you can guess what the theme is. Firstly due to the dust cloud you could only see glimpses of the grand prix circuit which itself was covered in sand. The theme park itself is really impressive as a structure, but you have to wonder why they build such a grand structure for a theme park, 90% of which is indoor. The answer is probably because they can! The benefactors are the public visiting, you can see what it looks like on it's web site and I think you'll agree it is pretty impressive. 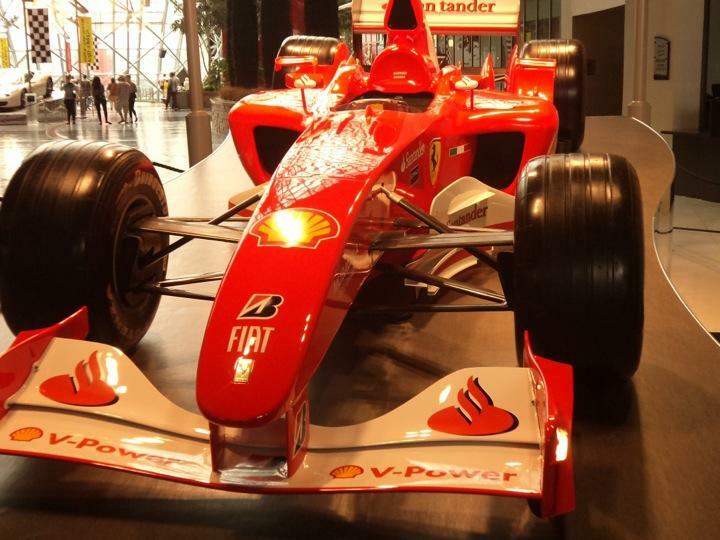 Inside is just crammed out with Ferrari cars, history, memorabilia and shows. All the way around I was thinking of Andy, debs and the boys thinking how much they would appreciate visiting here, probably more than us. They show interactive films of race tactics all explained as well as pit lane procedures and tactics from real races. There are IMAX films of drives with Schumacher and other great drivers around Real tracks. Then there are the rides. Not that many to be fair and to compound this one of them was not working due to the sand storm. Essentially though, the worlds fastest roller coaster was working. This propelled you from 0 to 249 kph in 4 seconds, and I kid you not that is faster than you Can imaging. They say it is as fast as an F16 taking off from an aircraft carrier with full afterburner and the steam catapult. Every which way it's pretty fast. Sadly I had to ride it alone, Josie threatened to get on at one point but bottled it! I'm sure Charlie, Ants or Laura all would have been on in a flash, it is a breathtaking 90 seconds. I did manage to get Frank Barbra and Wendy on a tamer ride and Josie on yet another but not in the same league as the fast one. There was loads of other stuff every Ferrari model you could imagine available for photo opportunities and all sorts of clothing and products to buy. Anyway enough of the theme park what of the city. Well it is an understated city all very new looking and with a large business district as far as I could see there was the usual high rise offices not the monster skyscrapers you expect at Dubai. They have the most lavish Emirates palace hotel that loads of people visited last night for cocktails (£90 per head- thought I'd give it a miss) and also they had a huge mosque with an 8 ton chandelier with 1200 bulbs in it all very cultural and nice but it couldn't keep me away from Ferrari world! Last night it was back to the ship and the passenger talent show, there were only four entrants thank God. A crooner - not too bad, a couple singing a duet - hopeless and a comedian from the outback (Valda Mick he was from that camel racing/trading town you spoke about) he was OK. Then the main star, he was a man from Queensland who was playing the harmonica, I thought I'd die laughing and what finished off a comedy evening was when the harmonica man asked the audience what he thought he could do with a particular small harmonica. There was a resounding you can stick it up your a**e from our table, which attracted several disgusted looks from those taking it all a touch too seriously. So ended another day on tour with the Hallidays a day tinged with sadness as it was our last day with our good friends and surrogate children Dan and Josie. More of that tomorrow when I will be reporting live from the Arabian Desert where we are staying In a bedouin tent, till then bye bye me hearties.